8 x 9 3/4 inches. 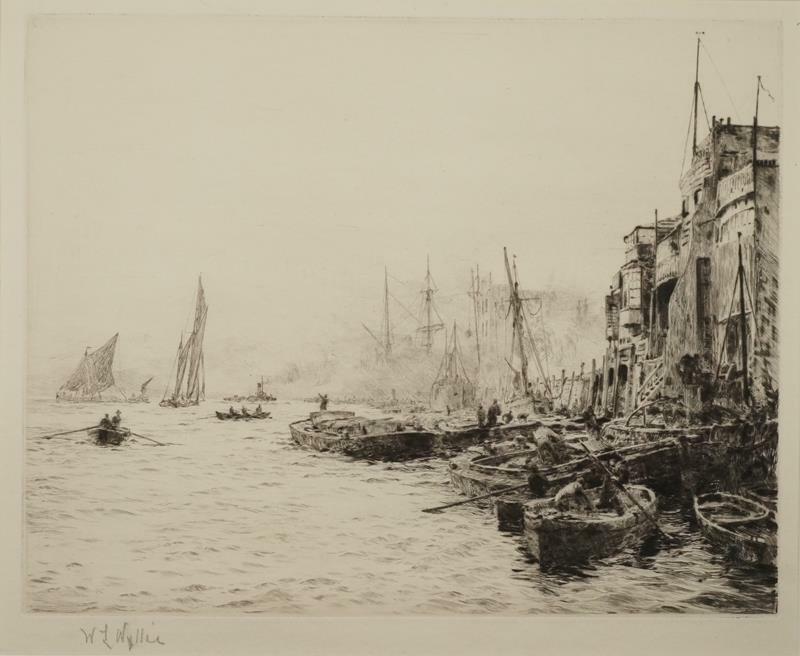 Painter in oil and watercolour and etcher of marine and coastal subjects, Wyllie was arguably the most important marine painter of his age. He studied in London at Heatherley's and the Royal Academy Schools where he won the Turner Gold Medal in 1869. His paintings, especially scnes of the Thames and the British fleet, became very well known through reproductions and engravings. During the last twenty-five years of his life he concentrated mainly on Naval and historical painting, often on a large scale, and on mastering the technique of etching. His charming and sensitive watercolours are usually of the coast of Northern France and occasionally of the Channel Islands. He exhibited frequently in London at the Royal Academy, Society of British Artists, New Watercolour Society, Grosvenor Gallery and elsewhere. Collections: Tate Gallery, National Maritime Museum, Victoria and Albert Museum, Royal Naval Museum, Portsmouth etc.